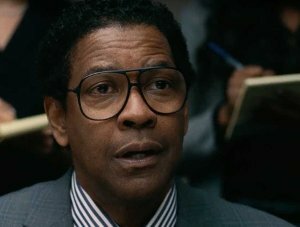 The Moviesite - Roman J. Israel, Esq. If you can’t break the law, break the system. 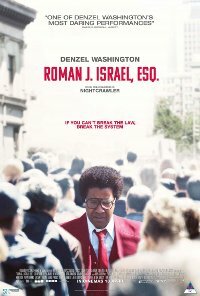 Hard-nosed liberal lawyer Roman J. Israel has been fighting the good fight forever while others take the credit. When his partner, the firm’s frontman, has a heart attack, Israel suddenly finds himself thrust into the spotlight. He soon discovers some unsettling truths about the firm... truths that conflict with his values of helping the poor and dispossessed, and finds himself in an existential crisis that leads to extreme actions. No persons under 13 (Language, Prejudice). Crime, Drama, On the art circuit. Language Moderate impact, fairly frequent crude language use that is uttered to demean as well as in a social context. Violence Low impact, infrequent violence without blood-letting is noted but does not warrant consumer advice. Prejudice Low impact, thematic social and class related prejudice is sustained throughout the film, with no clear disapproval there of.